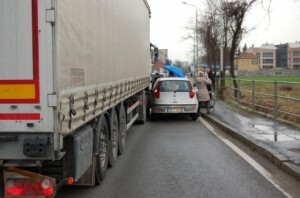 Was Truck Driver Error to Blame for Your Injury? You may believe truck driver error caused a serious injury crash in Orlando or Central Florida, but are unclear on how to prove that the trucker made an error. There are steps that you can take to preserve your rights and aggressively pursue legal action against the party at fault. The devil is in the details when it comes to truck injury cases. To get a thorough understanding of your options − as well as the potential obstacles in your case − talk to an experienced Orlando truck injury lawyer at the Kramer Law Firm. We can help you craft a smart, informed strategy to get compensation for medical care; loss of companionship or consortium; therapy and rehab; and lost present and future wage earning capacity, pain and suffering, mental anguish and punitive damages when possible. Truck accident science is actually a relatively young field, but surveys and fieldwork have helped authorities categorize the most common critical errors drivers make. Truck driver error due to driving too fast / driving recklessly. Truckers who complete their routes quickly get more work and thus get more money. This compensation system incentivizes truckers to speed. When they speed, they do not react as effectively to events on the road. Thus, they are more likely to get into serious injury crashes. Truck driver error due to alcohol, illegal drug, prescription drug use, or supplement use. Some truckers are addicted to controlled substances. Others just take drugs to complete their routes faster and/or to deal with boredom or lack of companionship. Obviously, drinking and driving can be dangerous. But it can also be dangerous to drink tons of caffeine and then “crash” (figuratively) while behind the wheel. Likewise, truckers who drink tons of soda and refined carbohydrates may get into trouble because of the blood sugars swings induced by these foods. A hypoglycemic episode can slow reaction time; the difference between a fatal crash and a scary "near miss" often comes down to hundredths of a second in timing. Truck driver error as a result of bad training and/or lack of familiarity with the roads or with the vehicle. In Florida, truckers must pass stringent requirements to do their work. If a trucker did not receive the proper training – or did not learn how to drive a particular vehicle safely – you can build an effective case for liability. Truck driver error due to general failure to drive safely. Failure to look at a blind spot before turning; failure to observe highway signage; failure to load or inspect the vehicle correctly; other types of “work a day” oversights or omissions can lead to dangerous, life changing (or even life ending) consequences. Were you injured in a Florida truck accident? The Kramer Law Firm can assess your rights and legal options and give you sound, thorough guidance about your best next steps. Call us at 855-Kramer-Now (855-572-6376) to set up a time to talk with one of our truck accident lawyers. We would be glad to meet with you at our office, at your home, or at the hospital. We want to make the process following a trucking accident as easy as possible for you and your family. We have the flexibility and experience to give you the representation you deserve.